Exclusive – After just having raised a ton of money ($165 million in venture capital in its first institutional funding round since its inception), online home-goods retailer CSN Stores is today consolidating its 200+ shopping sites into a single ecommerce website under one brand: Wayfair.com. 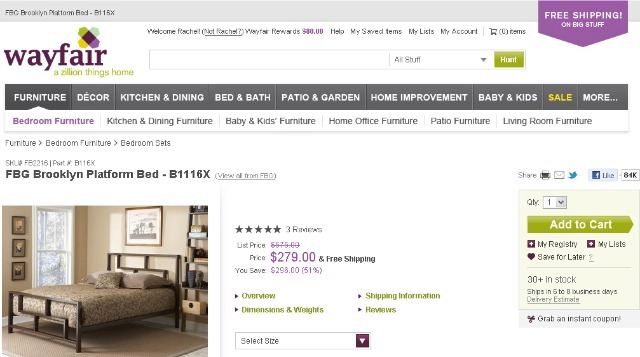 The rebranding has long been rumored, and the company publicly stated that it would be consolidating its sites and changing its name to Wayfair.com when the massive financing round was announced, but today sees the actual launch of the new “mega-site”. Wayfair .com launches with more than 4.5 million items from 5,000 brands on sale, ranging from furniture to lighting, cookware and other home and office goods. So wave goodbye to CSN Stores’ 200+ sites, some of which are actually really strong brands on their own: stores like Cookware.com, Luggage.com, Strollers.com, and BedroomFurniture.com will all be redirected to the new site and branded and marketed under the Wayfair.com umbrella as from today. Niraj Shah, CEO and cofounder of CSN Stores, tells me the company will keep the domain names for a period of time during the transition, but that they’ll consider selling them off when the time is right (meaning when traffic drops down low enough for the extra visitors not to matter all that much anymore). CSN Stores, now Wayfair.com, is a major ecommerce player any way you slice it, even though you may never have heard of it. In fact, the company is on track to register $500 million sales this year alone, up from $383 million in 2010. Its staff has more than doubled in the past two years, jumping from 400 to more than 850 employees today. The company plans to hire as many as 200 additional people by year’s end, bringing the total number to more than 1,000. The company was founded in 2002 and its main offices are in Boston, Massachusetts. So why the change to Wayfair.com? Primarily for obvious branding reasons: the company has long been spending a huge amount of money on marketing a lot of separate websites, and now they can focus on advertising just one. Well maybe three: the company’s current brands AllModern and flash sales site Joss & Main will remain alongside Wayfair.com. Other reasons for the consolidation of the separate shopping site are search engine optimization – which was apparently much needed after Google’s recent Panda update – and the fresh ability to make recommendations to shoppers based on their collective purchase history. The whole redevelopment operation took 18 months (and the consolidation will take another 3 to 6 months to complete), and Shah tells me a huge chunk of the $165 million in financing that was recently secured will be going to ‘aggressively’ marketing and building the new brand.